In 1715 the lands of Belrobbie became part of the Atholl Estate when they were sold to the Duke by John Robertson, eldest son of the deceased Alexander Robertson of Belrobbie. Before that, in 1706, there were three tenants: William Scott who held a 1 merk land; Adam Robertson who held a 10 shilling land; and John Seaton who also had a 10 shilling land. John Seaton was a tenant farmer until 1710, after which time there were no more Seatons recorded as tenant farmers, but they may have been cooper, shoemakers, masons or farm servants. By the late 1730s there were five Seatons living at Balrobie: Donald Seaton married Janet Menzies; Duncan Seaton married Elspeth Stewart; Neill Seaton married Janet Young; Robert Seaton married Elspeth McLauchlane and John Seaton married Margaret Young. They probably belonged to two or three related families and there certainly were at least two families of Seatons as their families inter-married (Donald Seaton in Wester Balrobie and Beatrice Seaton in Wester Balrobie were married 3 Jan 1754). The Donald Seaton who married Janet Menzies was born about 1690 at Balrobie. This is based upon circumstantial evidence, but it is known that he took part in the 1715 Jacobite Rising, and fought under the command of William Mackintosh, Laird of Borlum, at the Battle of Preston. After a bloody defence of the town in which hundreds of Hanovarian troops were killed, the small Jacobite force had to surrender. Forty five of the prisoners were executed but the remainder were sent to the New Plantations of America as indentured servants. Donald returned within a few years to farm at Ardtulichan with Duncan Seaton, who probably was his younger brother. The Blair Atholl Kirk Session minutes show that Duncan Seaton and his wife had been at Balrobie but moved to Ardtulichan between 1722 and 1728. The Seatons who farmed Stronchavie were the descendants of Donald Seaton and Janet Menzies. In 1706 the 3 merk land of Ardtulichan was equally split between Alexander Seaton and George Seaton, who may have been brothers, as shown by the payment of stipends for the Minister. Alexander Seaton in Ardtulichan is mentioned as being the master of James McLachlan in the Testament Dative and Inventory of John McIntyre in Blair, (Dunkeld Commissariot, 1717), but this may be a different Alexander as only George Seaton was paying a stipend after 1714. The surname of Young is not very common in Blair Atholl parish, so it is quite likely that Janet Young was the sister of Margaret Young who married John Seaton in Balrobie. It is also possible that they were related to John Young in Croftvickewan, whose father Donald had been a Kirk Elder when Mr Duncan Stewart had been the Minister. James 7 Nov 1735 . . Balrobie d.
Robert Seaton prospered at Balrobie and could afford having a servant. The Blair Atholl OPR records that Robert Stewart, servant to John Seaton in Wester Balrobie and Beatrix Robertson, servant to Robert Seaton in Wester Balrobie, married 20th November 1744. Very few marriages were recorded in the Blair Atholl OPR before 1744 so it is not surprising that a marriage has not been found for Robert Seaton and Elspeth McLauchlane. Their first child was born in 1738, so it is surprising that the next child was not born until 1752, a gap of nearly 14 years. As the later children were born at roughly four yearly intervals, one might have expected there to be another two or three childen born between 1738 and 1752. There is one very strong candidate - Margaret Seaton. On 29 Jan 1771 Donald Campbell in Ceannaghlinne, Moulin parish, and Margaret Seaton in Wester Balrobie, were married. As girls tended to marry in their early twenties, one would expect Margaret to have been born in 1751 or a few years earlier. Now in the 1740s there were two Seaton families at Wester Balrobie, probably two brothers; John Seaton who was married to Margaret Young and and Robert Seaton who was married to Elspeth McLauchlane. John and Margaret farmed Wester Balrobie until 1750, after which time they moved to Fonvuick where their son George was born. So if Margaret was their daughter she would have given her parental home as Fonvuick and not Wester Balrobie. Robert and Elspeth's eldest son John continued farming Wester Balrobie after their deaths, right up until his death in 1786. This strongly suggests that Margaret Seaton was his sister and her name has been added to the family accordingly. On 15 Jun 1773 Donald Robertson in Easter Balrobie and Elspeth Seaton in Wester Balrobie were married. So, in a similar manner to that of Margaret Seaton, it can be argued that Elspeth Seaton was, most likely, another daughter whose baptism was not recorded and likewise her name has been added to the family. The last name that probably should be added to the family is that of Donald Seaton. He was living at Wester Balrobie when he married Margaret Scott in Balinloin of Shierglas on 12 Jan 1768. As it was usual for men to marry in their late twenties or thirties, he probably was born in the early 1740s as a younger brother to John who 'inherited' the lease on Wester Balrobie. Donald(?) ~1740 Margaret Scott 12 Jan 1768 Easter Balrobie h. Elspeth(?) ~1750 Donald Robertson 15 Jun 1773 Wester Balrobie h.
Beatrice 7 Sep 1752 Donald Forbes 30 Dec 1780 Rinancoillach h.
Duncan 10 Feb 1756 Margaret Cameron 12 Jul 1787 Fonvuick h.
Janet 10 Oct 1760 James Forbes 24 Jan 1785 Rinancoillach h.
It is recorded in the Blair Atholl OPR that John Seton in Wester Balrobbie and Isobel Stewart in the parish of Dull were married 17th February 1774. This provides very little information about the parentage of Isobel Stewart. Probably she was in her twenties when she married and, as her second son was baptised as James, her father also had that name. Dull parish also covers a large, disjointed, area but she probably came from the Glen Fincastle area, just to the south of Balrobie. John Seaton, as eldest son, appears to have taken over the lease on Balrobie farm from his father, as this is where all of his children were born. Isabel 6 Jul 1777 . . Wester Balrobie d.
18 Jan 1834 Aldgirnaig h. 1849? John 15 Jun 1786 . . Wester Balrobie d.
The Blair Atholl OPR records that John Robertson in Fonvuick and Elspeth Seton in Balnald of Fincastle, Dull parish, married 23 Jul 1796. As Elspeth died before 1855 there is no death certificate to confirm her parentage, but all the fact support the possibility that they were John Seaton and Isobel Stewart in Wester Balrobie. Firstly, she is of the right age and the only other Elspeth or Elizabeth Seton to be born at around the same time belonged a family in Moulin who probably left the district. Secondly, the naming of her children would seem to follow the traditional naming pattern. Thirdly, her mother probably came from Glen Fincastle and her brother Robert was farming Balnauld of Fincastle by 1818 and probably earlier. There is a strong possibility that Robert Seton and his sister Elspeth went to their mother's relatives in Fincastle as servants, with her marrying from there and her brother taking over part of the Balnauld farm before getting married himself. John Robertson and Elspeth Seton farmed part of Fonvuick for all of their married lives, and in the 1851 census John Robertson is described as a blind farmer, aged 82 years and a widower, living at Balrobie with his grown-up children, James, Margaret and Elizabeth. The Minister of Moulin's 1820 census shows that Margaret Seaton was employed as a servant by her brother James Seaton and his wife, Helen Reid, at Faskally House, where James was a gardener. In the 1841 census she may be the 50 year old agricultural labourer living at Inch of Aldgirnaig, next to Peter Seaton and his wife. Her brother James Seaton and his second wife, Grace Robertson, were living just down the road at Aldgirnaig where James Seaton was both farmer and spirit dealer (publican). She seems to have still been living at Aldgirnaig in 1851. Margaret Seaton, unmarried pauper, died at Aldgirnaig in the parish of Moulin, 1st April 1863 aged 84 years. Parents given as John Seaton, farmer and Isabella Stewart. The informant was Isabella McLauchlan, occupier. Robert Seaton and Jean MacLauchlane, both in this parish, gave up their names to be proclaimed in order to marriage. Jean McLauchlane was the daughter of John McLachlan (from Dull parish) and Janet Seton (from Moulin parish) who married 16 July 1791 (Dull OPR). She was born 26 Feb 1798 (Dull OPR). The identity of her mother Janet Seton is uncertain, but she might have been born in 1763 (McLagan). If so, then she was 28 years old when she married. Their 18 year old daughter Isabella was living nearby at Little Miltown of Fincastle, where she was a servant to Elizabeth Stewart, Peter Stewart and Isabella Robertson. Their daughter Isabella, unmarried and aged 25 years, was working as a house servant for James Robertson the farmer at Lick, on the south side of Loch Tummel. The 1851 census return shows that she had been born in Dull parish. There is another Seaton living closeby but her parentage is unknown. Margaret Seaton aged 4 years and born in Perth is shown as the grand-daughter of James Robertson and his wife Christian, farmer in Fiermore, Glen Fincastle. It is possible that she was an illegitimate child to James's daughter Jean. The last mention of Robert Seaton is in the Tenandry Census for 1861 - Tenandry comprised parts of the parishes of Blair Atholl, Moulin and Dull. Their son James was a farmer at Ardgualich by this time, and his sister Janet was keeping house for him. Helen McLauchlan (Jean's sister) married to James Robertson died at Balnald of Fincastle, 1st December 1869 aged 67 years. Her parents were given as John McLauchlan, farmer, and Janet Seaton. Informant was her brother Robert McLauchlan in Balnald of Fincastle. Also living at Balinauld (27) was his nephew John Seaton, the youngest son of his brother James. John Seaton was married to Betsy McIntosh and had three children at the time: Susan aged 7; Archibald aged 4 and Helen aged 1. In addition, Archibald Seaton, the eldest son of his brother James, was living with his wife Christian MacLauchlane at nearby Milton of Fincastle. Robert Seaton, farmer, married to Jean McLauchlane, died at Balinauld 1st August 1862 aged 82 years. Parents given as John Seaton, farmer, and Isabella Stewart. The informant was his son, John Seaton. Jean and her family were still at Balnauld in 1871, and her eldest son John had become a gamekeeper. Jean, John and Isabella were still living at Balnauld in 1881. Firstly, there was £5 in cash held in his house. Secondly, his household furniture and other effects were valued at £19 6s 7d. Thirdly, the principal sum of £43 2s, with £1 4s 10d interest, was deposited with the Union Bank of Scotland in Pitlochry. Fourthly, the principal sum of £78 6s 6d, with £2 5s 1d interest, was deposited with the Bank of Scotland in Pitlochry. Fifthly, the sum of £6 10s was due to the deceased as Ground Officer's wages. This amounted to £155 15s, which was claimed by his brother Alexander Seaton, gardener, living at 7 Oakfield, Pitlochry. James 11 Jun 1826 Ann Robertson 19 Jul 1867 Moulin h.
On 3rd June 1881 at West Castle Road, Edinburgh, David Lindsay mason and widower aged 45 years living at 5 Nicolson Street, Edinburgh, married Ellen Seaton domestic servant and spinster aged 48 years living at 19 Ainslie Place, Edinburgh. His parents were given as Robert Lindsay, deceased weaver, and Ann Clark. Her parents were given as Robert Seaton, deceased shoemaker, and Jenny McLachlane. The marriage was witnessed by Alexander Seaton and Agnes Donaldson. Helen was employed as a domestic servant by Patrick Blair, Writer to the Signet, and his wife The Honourable Eleanor Jane Ross Moncreiff. Helen Seaton, widow of David Lindsay journeyman mason, died at Oakbank Pitlochry on 2nd December 1906 aged 84 years. Parents given as Robert Seaton, shoemaker, and Jane McLauchlane, both deceased. The informant was her brother Alexander Seaton in Oakbank, Pitlochry. In the 1861 census James Seaton and his sister Janet were living in Ardgualich at the east end of Loch Tummel, where the ferry used to cross to Duntanlich on the south side. On 19th July 1867 at Dunkeld, James Seaton aged 40 years, gamekeeper residing at Milton of Fincastle, married Ann Robertson aged 30 years, also residing at Milton of Fincastle. His parents were given as Robert Seaton, shoemaker, and Jane McLauchlan. Her parents were given as Alexander Robertson, shepherd, and Elisabeth McLaren. Witnessed by Archibald Seaton and James Smith. James was a carpenter in 1881 census. Helen was the daughter of Alexander Reid and Elspeth Robertson, born 3 Jan 1793, Moulin OPR. Alexander Reid was the woodkeeper at Faskally House where James was the gardener. The Minister of Moulin carried out his own census of parishioners over a five year period from December 1820, twenty years before the first official National Census of 1841, and both families are shown at Faskally House. The servant, Margaret Seaton, probably was James's older sister. James Seaton and his wife had four children between 1817 and 1826, but then Helen Reid died and James remarried. James Seaton (Moulin parish) and Grace (Girsel) Robertson (Logierait parish), married 18 Jan 1834 (both parishes). James Seaton and Grace (Girsel) Robertson had two children: James, 30 May 1836; and Christian, 3 Jun 1838. James's combined families appear in the Moulin 1841 census, living at Ardgirnaig where James was both a crofter and a spirit dealer (his son John's death certificate states that James was a publican). Identities of Donald Cameron and Janet Seaton are unknown. His daughter Vere was in Methven, 1/3 aged 17 years and probably employed as a servant. James Seaton probably died in 1849 as, in Kilmaveonaig churchyard, there is the flat stone in front of that belonging to James's son Archibald which is inscribed "I S 1849" and the letter J is often carved as an I. Need something on his wife Grace............... HERE. Vere (Vera) 7 Sep 1821 William Stewart 16 Jun 1850 Bridge of Tilt h.
James 30 May 1836 . . Aldgirnaig d.
Christian 3 Jun 1838 . . Aldgirnaig d.
At some time between 1841 and 1846 Archibald Seaton left Aldgirnaig and moved to Little Miltown of Fincastle Balmhuillin-beg), close to his uncle Robert Seaton who was a shoemaker in Balinauld of Fincastle. Archibald probably worked on the farm of John McLauchlan whose daughter he married, and both families appear on the Dull Census of 1851. Christian was the daughter of John MacLachlane and Helen MacEwing, his second wife, born 1st April 1811. John MacLachlane's first wife was Janet Seaton from Moulin parish who he married, 16th July 1791. Janet Seaton died soon after the birth of their daughter Helen in 1802. John MacLachlane then married Helen Howan (McEwan), 9th July 1803. Helen's surname varies with each child's baptism (Ewen, 1804; MacEwen, 1806; MacEwing, 1811) and there may be others. Archibald Seaton and Christian McLauchlane, both in Miltown of Fincastle, gave up their names to be proclaimed (in order to marriage). John McLauchlan seems to have died by 1861 as Archibald and his wife were farming Little Miltown in the 1861 census for Tenandry. The couple were still farming Little Miltown in the 1871. In the 1881 census for Tenandry. Jane Lamond was Archibald's distant relative, the daughter of Donald Lamont and Jane Douglas. Christian MacLachlan, married to Archibald Seaton, retired farmer, died at Wester Balrobbie 8th September 1892 aged 81 years. Parents given as John MacLachlane, farmer, and Hellen Ewan, both deceased. There were no children from the marriage. Archibald Seaton died at Bridge of Fender in 1908 and was buried in Kilmaveonaig churchyard. Archibald Seaton's Last Will and Testament was recorded at Perth Sheriff Court, 18th February 1908. The trustees were his brother John Seaton residing at Tenandry, and his nephew Donald Stewart, gardener at Knockderry Castle, Cove, Dunbartonshire. After the payment of all his just and lawful debts, deathbed and funeral expenses and the expense of executing his trust, his estate was equally split three ways, between: his brother John Seaton; his widowed sister Vere Seaton or Stewart at the Post Office, Fenderbridge; and his niece Isabella Stewart at the Post Office, Fenderbridge, Vere Seaton's daughter. William Stewart in Bridge of Tilt and Vere Seaton in Aldgirnaig, Moulin parish married 16 Jun 1850. William Stewart worked as a carrier as shown in the 1851 census return for Bridge of Tilt. It is an odd coincidence that they were living next door to Christian Seaton, the dressmaker, and her brother Donald. Initially, the family moved around quite a lot, but eventually returned to Blair Atholl where Vere was post-mistress at Fenderbridge. Helen 31 Mar 1851 . . Fenderbridge d.
William 27 Sep 1852 . . Fenderbridge d.
Grace 6 Apr 1854 . . Fenderbridge d.
James 12 Sep 1855 . . Fenderbridge d.
Donald 28 Sep 1857 . . Fenderbridge d.
Alexander 8 Jun 1862 . . Fenderbridge d.
Isabella 29 Jun 1865 . . Fenderbridge d.
Christina 31 Aug 1869 . . Fenderbridge d.
John Seaton married Betsy McIntosh 14 Sep 1851 (Moulin OPR), two days after their son James was born. By 1861 they had moved to Balinauld of Fincastle where John's uncle, Robert Seaton, was a shoemaker. His elder brother, Archibald, and his wife were living next to them at Milton of Fincastle. John and Betsy still were living at Balnauld in 1871 but the older children had left the family home. At the time of the 1881 census John and Betsy were looking after a grandchild at Balnauld. John Seaton, labourer, and widower of Betsy McIntosh died at Woodside Village, Cargill, 10th March 1913 aged 86 years. Parents given as James Seaton, publican, and Isabella (an error) Reid, both deceased. Informant was James Seaton, his son. Alexander 1863 . . . d.
John 1865 . . . d.
On 6th December 1872 James Seaton, ploughman aged 24 at Letter, parish of Caputh married Isabella Seaton, aged 20 in Craigbea, parish of Logierait. His parents were given as John Seaton, labourer, and Betsy McIntosh. Her parents were given as Alexander Seaton, deceased shepherd and Jean Paterson. The witnesses were Alexander Seaton and John Seaton. In the 1881 census James Seaton was working on the farm at East Hatton in Cargill parish (2/2). In the 1881 census Susan Seaton was working as a cook for James Brown, Collector Inland Revenue, and his family at Orangefield House, Prestwick, Ayrshire. She was 27 years old and unmarried. Donald Seaton in Wester Balrobie and Margaret Scott in Balinloin of Shierglas, Dull parish, married 12 Jan 1768. John 12 May 1769 . . Easter Balrobie d.
Donald Campbell in Ceannaghlinne (Moulin) and Margaret Seaton in Wester Balrobie, married 29 Jan 1771. Donald Campbell and Margaret Seaton had seven children, the first four being born in Moulin parish and the last three at Wester Balrobie. Margaret Seaton died after the birth of her seventh child and with so many children Donald Campbell needed a new wife. Donald Campbell in Wester Balrobie and Margaret McIntosh in Chamberbane, married 12 May 1792, but with the birth of their first child, John, the OPR registrar accidentally wrote the mother's name as Margaret Setton, before scoring it out and correcting the mistake with Margaret McIntosh. Ann, the last child, was born at Ardtulichan in 1808. Duncan 18 Jun 1771 . . Wester Balrobie d.
Donald 11 Sep 1777 . . Wester Balrobie d.
Isabel 2 Mar 1782 . . Wester Balrobie d.
Alexander 2 Apr 1788 . . Wester Balrobie d.
Margaret 8 Dec 1796 . . Wester Balrobie d.
Ann 22 Oct 1808 . . Wester Balrobie d.
John Campbell, son of Donald Campbell, farmer, and Margaret McIntosh, died unmarried at Corriehulichan, Tenandry, 22 May 1855. Informant was Alexander Campbell, his cousin. Donald Robertson in Easter Balrobie and Elspeth Seaton in Wester Balrobie, married 15 Jun 1773. All of their four children were born at Easter Balrobie but the registrar of the OPR made an error and wrote Christian Seaton instead of Elspeth Seaton for their first child, Jannet. Jannet 12 May 1774 . . Easter Balrobie d.
Elspeth 12 Jun 1778 . . Easter Balrobie d.
Alexander 19 Mar 1784 . . Easter Balrobie d.
Donald 15 Apr 1787 . . Easter Balrobie d.
The Blair Atholl OPR states that Donald Forbes in Lettochcroy, Moulin parish, and Betty Setton in Wester Balrobie, married 30th December 1780. This may appear to be odd as Betty normally equates with Elizabeth but this is an example of where spoken Gaelic was being written in an anglicised form and her name probably was pronounced more like 'Beattie'. Donald Forbes in Lettochcroy in Ground of Urrard and Betty Seton his spouse had a child baptised. The child's name - Alexander. Baptised, Donald (son) to Donald Forbes in Lettochcroy and Betty Seton his spouse. There were two Lettochs in Moulin parish. One was close to Pitlochry but this Lettoch was next to Urrard (Rinrory House) on the Killiecrankie battlefield. Donald's brother James married Beatrice's sister Janet on 4th January 1785. The two brothers and their families were living at Rinancoillach, at the top of Glen Girnaig, in 1789 which is where Donald's daughter Margaret was born. It cannot be a coincidence that their brother-in-law, Duncan Seaton was also living there with his family at the same time. By 1791, all three families had gone their separate ways. Donald Forbes returned to Wester Balrobie, where his wife had come from, probably as an agricultural labourer. Grissel, or Grace, was born there in 1791. Margaret Forbes, married to James McGregor, agricultural labourer, died at East Haugh of Moulin on 28th May 1863 aged 75 years. Parents given as Donald Forbes, farmer, and Betsy Seaton, both deceased. The informant was her daughter Margaret McGregor. Alexander 6 Nov 1781 . . Lettochcroy d.
Donald 25 Oct 1786 . . Lettochcroy d.
(Grace) 10 Sep 1791 . . Wester Balrobie d.
The Blair Atholl OPR records that Duncan Setton in Balrobie and Margaret Cameron in Aodantian, married 12th July 1787. Aodantian is Edintian at the top of Glen Fincastle in Dull parish. Soon after they were married Duncan Setton and his wife were living at Rinancoillach where their first two children, Robert and Donald, were born. Duncan's two sisters, Beatrice (Betty) and Janet had married Donald Forbes and his brother James, respectively, and they too were living at Rinancoillach. By 1790 the three related families went their separate ways, with Duncan Setton moving to Fonvuick with his wife and two daughters. All of the other children were born at Fonvuick. His daughter Elizabeth's death certificate says that Duncan Setton was a crofter. As a word of caution, there is another couple with identical names living at the same time in the same area. Duncan Seton and Margaret Cameron both in this parish were booked in order to marriage (Moulin OPR, 14th October 1794). The family moved to the City of Perth where Duncan worked as a tailor, and their son James was born, 19th September 1798. Donald 14 Nov 1790 . . . d.
2w. 16 Dec 1827 Fonvuick h.
The marriage of Robert Setton to Marjory Douglas is recorded twice: once in Logierait parish, as expected, but also in the City of Perth. This second entry is not immediately obvious as the Douglas surname is given as Douglass, and the forename as Mey (sic). However it was not uncommon for May to be used as the familiar name for Marjory. Robert Setton in the parish of East Church, Perth, and Marjory Douglas in Tynrich gave up their names for proclamation of marriage. Married at Perth by the Rev. Mr Findlay. Marjory Douglas's parents were John Douglas and Mary (or Marjory) Robertson, who married 18 Dec 1781 in Logierait parish. She was born 16 Jan 1791 in Logierait. Shortly after they were married Robert Seaton and his wife moved from Perth to London. Alex Saunders Martin, the family historian, says that the family lived on Fleet Street, St Bride parish, London, where their sons Robert, John and James were born. In 1826/27 the family returned to Scotland and settled in Newtyle, Angus, but soon moved to Tynrich (just north of Balinluig) in Logierait parish where Marjory Douglas had relations. Here the family established a shoe shop which ran for many years. This is shown in the 1841 census. Robert Seaton died before the 1851 Census. 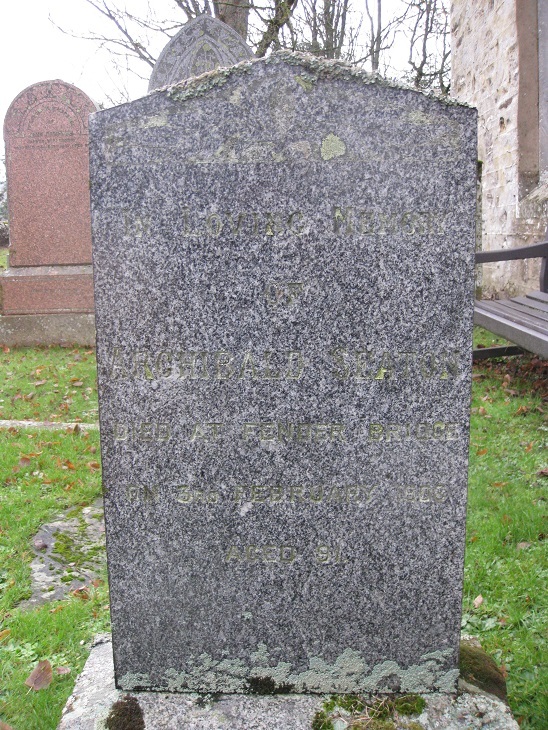 When James R. Seaton surveyed the monument inscriptions of Kilmaveonaig churchyard in 1974, he added a comment to entry 48 (flat stone in turf initialed R.S., between centre window of church and flat stone 47) saying that it was the burial place of Robert Seaton, born 21st July 1788, died about 1850. Robert Seaton died without leaving a will but, in an attempt to recover money owing to him, his widow gave in an inventory of Roberts's personal estate and had it recorded in the Perth Sheriff Court book, and this states that he died at Tynrich, 14th May 1850. Firstly there was £34 deposited with the Perth Banking Company, with 3s 9d interest thereon. Secondly there was a bill (an IOU) for £15 drawn upon and accepted by John Douglas, farmer in Croftnaskellaig dated 2nd February 1850 and payable two months after date, with interest of 1s 7d thereon from 5th April to 14th May 1850. Unfortunately there was a note saying that the debt was utterly desperate owing to the debtor's inabillity to pay it. Thirdly the deceased's household furniture, effects etc. were valued by Finlay Scott, appraiser, at £23 7s 11d. There then followed a list of his debtors, presumably for shoes bought or repaired, giving names and locations. The first 45 were of debts expected to be recovered and amounted to £68 4s 4d. The next 62 were dubious debts amounting to £146 18s of which 4/9th was expected to be recovered (£65 5s 9d). The last 34 debts amounting to £81 0s 5d were described as desperate and unlikely to recoverable. Even if not all of the debts were honoured, there was enough capital to continue the shoemaking business as shown by the 1851 census for Tynrich, Logierait parish. Margaret 30 Apr 1828 . . . d.
In the spring of 1839 the Earl of Eglinton had arranged to hold a grand tournament at Eglinton Castle during the month of August, and amongst the knights who resolved to compete at the lists was Lord Glenlyon, who entered himself under the style of 'Knight of the Gael'. About the beginning of August Lord Glenlyon determined to take a Highland bodyguard with him on his expedition into Ayrshire, and notice was given from Blair Castle to that effect. From a large number who volunteered their service a corps was selected, consisting of 3 sergeants, 4 corporals, 4 pipers, 56 privates, and 2 orderlies, under the command of 5 officers. One of the selected privates was Robert Seaton, shoemaker in Tynrich, height: 5 foot 8½ inches. John Seaton married Janet McFarlane, 19 Nov 1850, which is recorded in both the Logierait and Little Dunkeld OPRs. 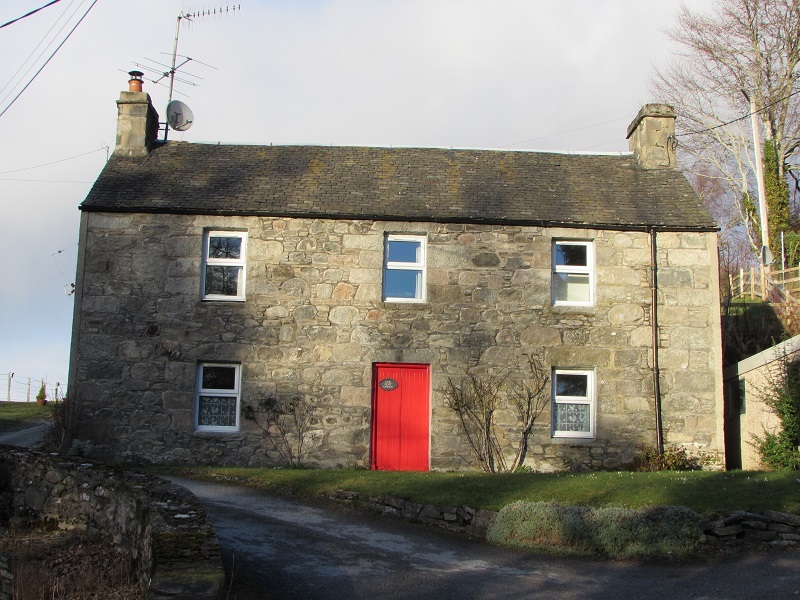 The family were living in Newtyle and Kinclaven before settling in Kinloch Rannoch around 1860. Blair Atholl churchyard monument inscription (C14) "In loving memory of John McFarlane Seaton J.P. who died at Craigour, Blair Atholl, 19th October 1950 aged 81 years. And his wife Jane Stewart who died 23rd February 1954 aged 78 years". John Seaton, master shoemaker aged 52 years, married to Janet McFarlane, died at Kinloch Rannoch 6th January 1873. Parents given as Robert Seaton, deceased shoemaker, and Marjory Douglas. Informant was his son Robert Seaton. After the death of his father, Robert Seaton moved to Blair village with some of his family, as shown by the 1881 census. Seaton's, the saddler and shoemaker, specialised in hand made boots and shoes and the business remained in the family until it closed in 1975 upon the retiral of Alistair Seaton. Jeannette's maiden name was seaton; she was born in Perthshire SCotland, in the year 1837. She emigrated to the United States with the family in 1850 when they settled at Keithsburg, Illinois. In 11855 she was uinited in marriage to Jeremiah McIntyre. Eight children were born to this union, three of whom died in infancy. Those who survive her are J.W. McIntyre of Red Cloud, Nebraska; R.H. McIntyre of Milwaukee, Oregon; J.T. McIntyre of Burchard, Nebraska; Mrs Christian Dingwell, Pawnee City, Nebraska; and Mrs Ida Sloan, Eskridge, Kansas. Jeremiah McIntyre died in 1868. In 1870 she married Joseph Patterson. THis union was blessed with four children, all of whom are still living. They are Mrs J.A. brown, Palisade, Nebraska; Mrs L.D. Carter, Burlington Junction, Montana; J.C. and Miss Della who are still living at home. In 1874 the family moved from Kiethburg, Illinois, to Lenox, Iowa, and in 1882 moved to Pawnee Co. Nebraska, where they resided ten years, and then moved to Superior, Nebraska, in 1892 where they located on a farm. She is survived by a husband, nine childre (four sons and five daughters) forty grandchildren and fifteen great-grandchildren. 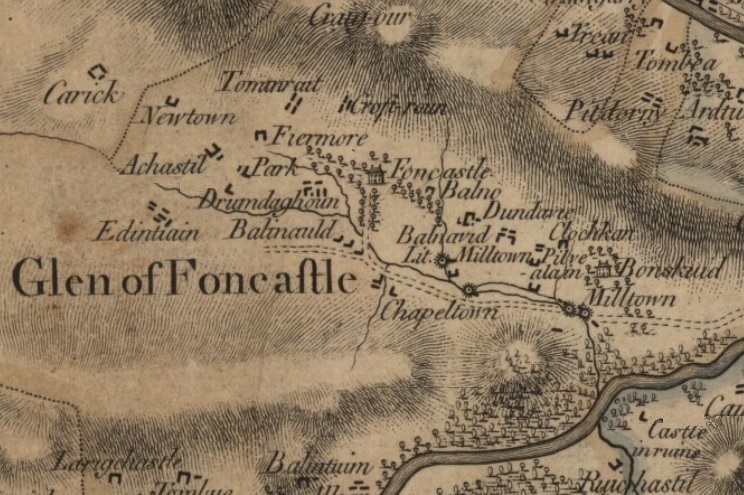 John Seaton in Fonbhuick (Fonvuick) and Isobel MacDonald in Carie, parish of Logierait, married 24th December 1820. Isobel died before 1827 as the Blair Atholl OPRs also records that John Seaton in Fonbhuick (Fonvuick) and Christian Seaton in Ardtulichan, married 16th December 1827. John Seton in Ardtulichan married Isobel Robertson in Fonvuick the following year, which suggests that he was Christian's brother, and the death certificate of John Seton in Ardtulichan gives his parents as John Seaton and Elspeth McRae or McCraw in Ardtulichan. There are no entries in the Blair Atholl OPR for any of John Seaton's children, but they are listed in the 1841 census for Fonvuick. As Duncan was 18 years old in 1841 he was born around 1823 and therefore Isobel MacDonald must have been his mother. All of the others were born after 1828, so must be the children of Christian Seatton. Duncan ~1823 . . Fonvuick d.
Elizabeth ~1829 . . Fonvuick d.
John ~1831 . . Fonvuick d.
Robert ~1833 . . Fonvuick d.
Donald ~1836 . . Fonvuick d.
George ~1839 . . Fonvuick d.
John Saunders was the son of William Saunders in the parish of Blairgowrie and Isobel Neil from the parish of Lethendy, who married 20th January 1793. John married Margaret Seaton from the parish of Blair Atholl on 20th June 1819. Margaret was the daughter of Duncan Seaton and Margaret Cameron in Fonvuick farm near Killiecrankie. John was an overseer in a linen factory in Blairgowrie. In the first week of March 1852 John and Margaret, along with daughters Elizabeth (Betsy), Mary and Janet (Jessie), son John, daughter Isabella (with her husband Peter Reid and son John Reid) and son James (with his wife Catherine and their children Margaret, Arthur and James) left the port of Leith with a party of Scots in a sailing ship bound for Canada. They entered the mouth of the St. Lawerence river in the last week of April. From here they traveled to Hamilton, Ontario where their son Duncan and his wife lived. John Saunders died 13th March 1872 and Margaret Seaton died 15th November 1881, at their late residence Lot 3, Concession 1, Luther Township. Both were buried in Greenfield cemetery near Arthur, Ontario. Allan Stewart in Balrobie and Janet Seatton in Fonbhuick (Fonvuick), married 11 Nov 1827 (Blair Atholl OPR). Christian 15 Aug 1828 . . Balrobie d.
Duncan 26 Jan 1832 . . Balrobie d.
Susan 12 Aug 1833 . . Balrobie d.
Margaret 30 Apr 1837 . . Balrobie d.
The marriage of James Forbes and Janet Setton is recorded in both the Blair Atholl and Moulin OPRs. James Forbes in Lettochcroy, Moulin parish, and Janet Setton in Wester Balrobie married. James's older brother, Donald Forbes, had married Janet's sister Beatrice and all four of them lived in Rinancoillach, at the top of Glen Girnaig. It cannot be a coincidence that their brother-in-law, Duncan Seaton was also living there with his family at the same time, but by 1791, all three families had gone their separate ways. James Forbes and Janet Setton had two girls, as recorded in the Blair Atholl OPR. The first was Margaret who was born at Rinancoillach, 24th April 1789. The next child appears to have been born fourteen years later so, probably there were more children whose baptisms went unrecorded. 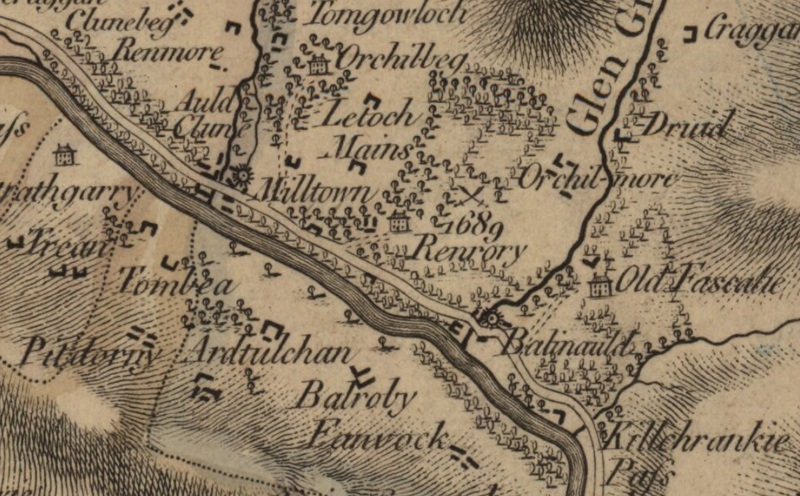 Balfuirt is shown as Bailephuirt on James Stobie's map of Perthshire (1783), and as Tynateid on the 1st edition of the Ordnance Survey map (1867). Margaret 24 Apr 1789 . . . d.
Isabel 22 Mar 1803 . . . d.
John Seaton probably was a farmer, or tradesman, as he was employing a male servant, Robert Stewart, in 1744. He may have been the son of the John Seaton who was joint tenant of Fonvuick 1712 until 1715 and probably longer. John Seaton had a tack (lease) for a 1 merk land and Alexander McLauchlan had a tack for a 2 merk land. Isobell 27 Nov 1743 . . Fonvuick d.
Hellen 23 Dec 1749 . . Fonvuick d.
George 1 Dec 1752 . . Fonvuick d.